The professionals at Jim Ryan Carpet Repair have proudly served residential and commercial customers in Jacksonville, FL and the surrounding areas for over 20 Years. We are locally owned and operated for your complete protection and customer satisfaction. 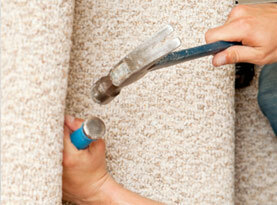 We specialize in carpet stretching, patching, seam repair and new carpet installations. From repairing high traffic areas, to new tack strips, stains, and burns Jim Ryan Carpet Repair provides complete carpet repair and new installations at prices that you won’t be able to resist. The repair & installation technicians at Jim Ryan Carpet Repair are 100% dedicated to providing you with the best service in the area, both before, during and after each job. At Jim Ryan Carpet Repair our carpet repair technicians can give even your oldest carpets a new lease on life for a fraction of the cost of a total carpet replacement. Depending on your needs, repairing and restoring your old carpet is a cost effective way of giving your home or business a makeover without the worry of breaking the bank. With one phone call to Jim Ryan Carpet Repair, you can enjoy the beauty of new looking carpets at a reasonable price with very little down time. If your carpets is coming apart at the seams, the knowledgeable repair technicians at Jim Ryan Carpet Repair have several different repair methods at their disposal to ensure your receive the best possible results. 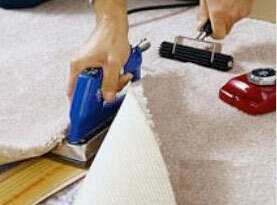 Firstly, our repair technicians will identify the type of carpet and customize a plan that will include using high quality glue or removing and completely replacing the entire seam. Our skilled repair technicians understand that carpet seams need to withstand a lot of wear and tear and they will need to do so for many years. We use the best products available to ensure you will be completely satisfied with the results. 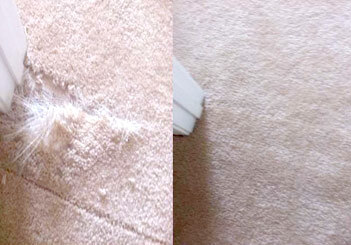 If you have carpet stains or other damage that has become permanent and you are looking for a cost effective way to make your carpets look just like new, a carpet patch is the perfect solution. 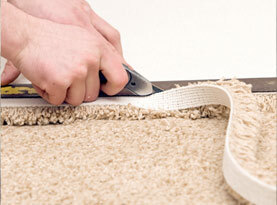 Our expert carpet repair technicians will ensure that the patch is a perfect fit with no overlaps or gaps at the seams. Our technicians can work with leftover carpet from your original installation or we can repurpose a piece of carpet from a closet to complete your carpet patching. At Jim Ryan Carpet Repair we have a huge selection of carpets available along with a professional carpet installation team to ensure it is installed right. Getting the perfect carpet for your home or business is much closer than you might imagine. Our specialists will work with you to help you select carpet that fits your lifestyle and individual needs at prices that just can’t be beat. Contact the professionals at Jim Ryan Carpet Care and speak with a customer service professional about carpet repair or replacement today! We look forward to hearing from you.